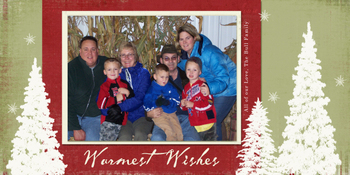 Holiday Card Promotion: Create Early and Save! Check out the valuable promotion that Shutterfly is running right now on holiday card making. If you order your holiday cards before October 23rd you can buy 50 cards and get 25 cards for free! That is a 33% discount. Here is a link to check out the details. Don't forget, the Shutterfly DSAT members have created some amazing holiday card templates for you to use when creating your cards this season! There is a beautiful selection that inspire and make the card creation process a breeze! Here is a sample.